The other day I took one of those silly quizzes on Buzzfeed that are incredibly pointless but undeniably entertaining. This one was supposed to tell you what your spirit animal is, and it gave me the Sunda colugo. Trust me to have a spirit animal that’s so strange that no one’s ever heard of it. Even though the quiz didn’t tell me why I was given the Sunda colugo, or even what a Sunda colugo is, I’ve decided to embrace my spirit animal. Hence, this blog post. Colugos are also known as flying lemurs, which is a bit of a misnomer since colugos are not lemurs and do not fly. In fact, everyone is a bit confused about where colugos belong taxonomically. Originally they were thought to be closely related to bats, but have since been considered more closely related to primates. One thing everyone can agree on though: colugos are weird enough to be placed in their own family, Dermoptera. There are only two species in Dermoptera, the Philippine flying lemur and the Sunda flying lemur. Both live in Southeast Asia, where there are plenty of rainforests and trees for these highly arboreal species. A colugo clutching a tree. It actually blends in pretty well, doesn’t it? You see, colugos spend pretty much all their time in and around trees. They’re completely useless on the ground, and really aren’t even that great at climbing – they ascend trees by a series of clumsy hops using their sharp claws to hold onto the tree. Because they are good at holding onto trees, either upside-down or on the side of they branch. But the place where the colugo is truly at home is in the air. They don’t actually fly, but they can glide, and do so with great grace and accuracy. 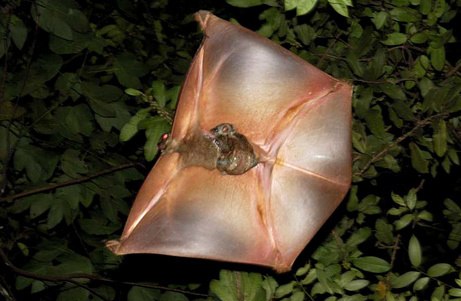 Colugos have some special adaptations that make their incredible gliding skills possible. 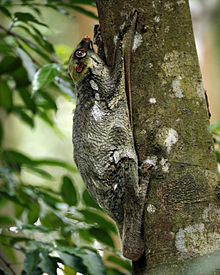 The most obvious of these is the webbed skin that covers as much of the colugo’s body as possible, from the animal’s neck to tips of the claws, all the way down its sides and out to its tail. The colugo’s paws are even webbed, just for completeness (I’m sure they actually have a very important function, like giving the colugo extra control in the air). These membranes let the colugo glide for impressive distances – up to seventy meters without dropping considerably in altitude. In order to avoid crashing into trees while soaring around, colugo’s eyes face forward in their skulls, to give them better depth perception. This is unusual for a prey animal – they usually have eyes on the sides of their heads to help them watch out for predators. The colugo makes up for this vulnerability by being nocturnal, although they might not be that good at it, as they make up 90% of the diet of the Philippine eagle, a diurnal predator. Flying colugo! Can you spot the baby hitching a ride? Colugos are not marsupials, though I think they want to be. They have one baby at a time, and they young colugo is extremely undeveloped. The little guy spends all of its time on its mother’s belly, even during flight. When the colugo is resting on a branch, she curls her tail over to make a nice warm pouch for her baby. But it gets better for baby colugo. If mama is hanging from a branch, the lucky baby gets a warm fuzzy hammock to sleep in. Who wouldn’t want that? As far as spirit animals go, I suppose I could do worse. Colugos are at least kind of cute, in their own special way. And they’re very unusual, just like me!